Though hard to believe in the Northeast Ohio area, summer is in fact just around the corner, which means it’s time for commercial landscaping companies to plant summer annuals. Impatiens and geraniums have a classic flower look with small curved petals surrounding a center, while marigolds are textured yellow balls. Salvia has the shape of a flame with a round bottom coming to a point at the top. These are only a few of the summer annual possibilities, and in addition to the variety of shapes, summer flowers are also the most colorful to choose from. This bodes well for planting in your summer containers. These containers can be large stone pots, window boxes, small clay pots, or more modern-looking aluminum plant holders. These are unique because of their mobility and size. Flowerbeds on your commercial property cannot be moved, therefore flowers must be planted where the beds are. However, containers can be moved to stand near an area of the building that needs brightening up, or as is most common, near an entrance. Having flowers near an entrance gives the impression that you care about your business. It gives you the chance to define who you are as a company by what flowers you decide should go into the containers. With flower beds near the street, you want to give off a professional look by keeping the look clean and classic. Having one type of flower in neat patterns or sticking with one color is a safe and appropriate choice when presenting your commercial property to those passing by. Summer annuals will look bright, eye-catching, and bring attention to your business, but will keep the tone of professionalism for which you are searching. When the customer is walking towards your business’s entrance, that is the time for them to get a feel for who you are as a company. Providing color and variety in the flowers in your containers will give off a positive vibe and stun your customers and visitors with their vibrancy. This type of creativity in containers may be a challenge for the average gardener. By using a commercial landscaping company, you can rest assured that your containers will have a fresh look. Turfscape has landscape designers on staff who can work with you to create a plan for your entrances to ensure a beautiful look that is simultaneously personalized to your business. When planting in summer containers, you will want to take size into consideration. Some planters stand tall at eye level while others are smaller and closer to the ground. You do not want containers to be so small they go unnoticed, but not so large they impede the entrance to your business. The purpose is to enhance your commercial property, not detract from it. With smaller planters, height is an important feature to draw the eye to the flowers and eventually upward toward your entrance. Some containers may need extra soil added to lift the plants to eye level. 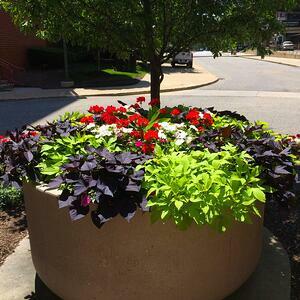 At John Carroll University, Turfscape added several inches of soil to large square planter boxes near the entrance of an academic building so that pansies could be seen from the sidewalk. Perennial ornamental grasses or spikes can also give your container height and be planted in the middle of a square or circular container. This makes them cost-effective as the perennials will stay year-round while annuals surrounding them can simply be removed and replanted based on the season. When planting summer annuals in containers, it’s important not to overcrowd the pot with plants. The flowers need room to grow and will fill in the pot with time. Most summer annuals will work well inside of summer containers, but if you are looking for a little extra flare, sweet potato vine will grow over the side of your containers, showing how your plants thrive. Don’t let the planting containers on your commercial property go through another season as an ashtray. Talk to a commercial landscaping company about summer annuals now.